At its essence, Steve’s art is about the beauty in life: the innocent loveliness of infants and children, the bond between mother and baby, the physical beauty of the female form in light and shadow, in stillness and in dance. The composition of a Hanks painting serves the emotion he sets out to paint, whether it be a vertical or horizontal canvas, the mystery in a woman facing downward, or how the upward tilt of a chin exudes confidence, the freedom of a girl’s spiraling limbs on a beach, or a young woman’s steady gaze at the wide horizon ahead of her. That said, Aspen, Colorado was an often-painted family vacation favorite, as well as New Orleans and Charleston, whose wrought iron and architecture and heavy green vegetation appealed to the artist whose home studio was in high desert. Steve Hanks lived most of his life in landlocked Albuquerque but his heart was near water. Contemplative figures were sometimes painted near shimmering lakes and rivers but the Pacific Ocean is where both pure joy and the complications of relationships played out in his art. In the fall of 2014, Hanks painted a rare self-portrait in his studio. It is uncharacteristically layered and complicated, befitting its subject. In the painting, there are reflections of reflections and he includes the tools of his trade and the studio artifacts that surround him. The life model, perched on the artist’s chair, studies her portrait on the easel. The tumbling quilt and her leg convey the tall verticality of the painting, yet the horizontal portrait and the framed art on the wall keep the eye focused on the center of the painting. The artist has stepped away from the easel and is framed in the circular mirror. What is he studying? The model, the painting, the life? In the mirror, above his head to the right, is the leading edge of a surfboard and below that, another mirror and within that, the reflection of the artist in the circular mirror and so on. 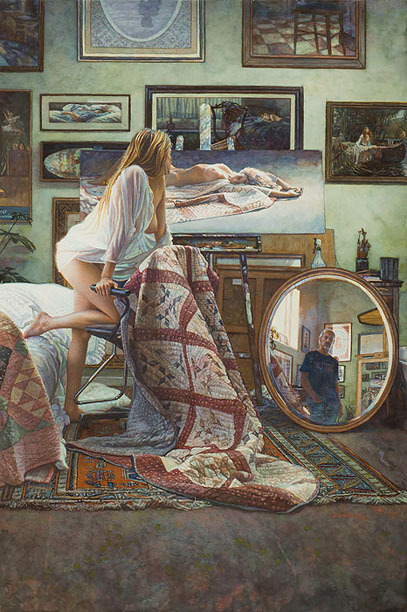 Steve Hanks’ In the Artist’s Studio is something special for his collectors and fans. Far more than a sneak peek into his workspace, it is a gem of a multi-layered autobiography. The framed art on the studio wall is mostly his own.